Miyajima means “shrine island,” and this small island has since ancient times been a sacred place of worship, where the gods were thought to live in harmony with mortal man. 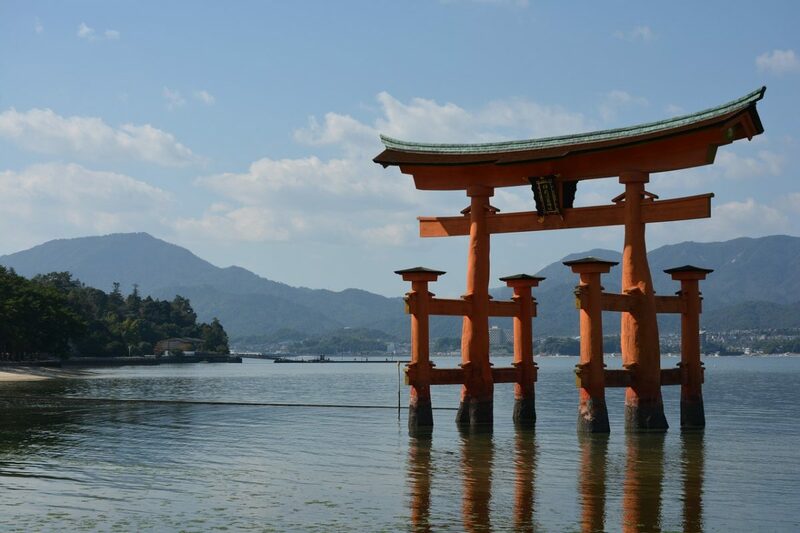 Also called Itsukushima, Miyajima Island is a densely wooded place of tranquil peace and beauty. The island is sparsely populated and home to native deer and wild monkeys. 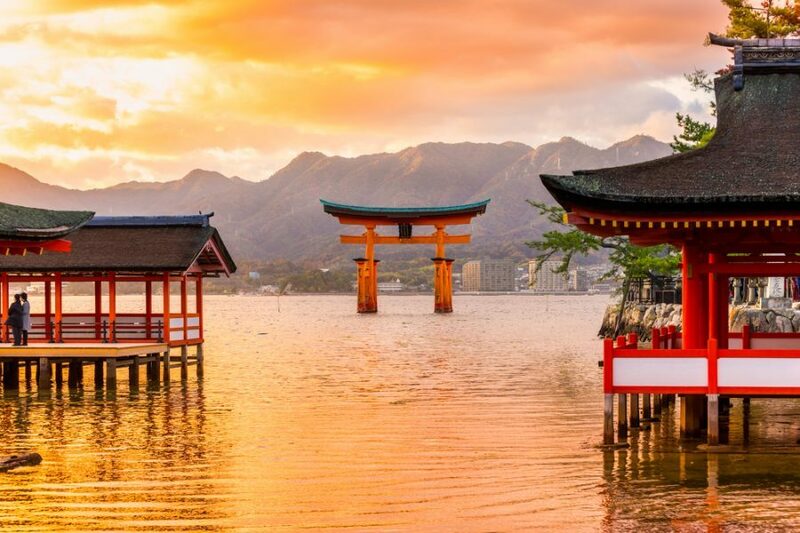 The Itsukushima Shrine and its Torii Gate have been declared a UNESCO World Heritage Site, and have been celebrated as one of the Three Views of Japan since 1643. Miyajima Island is located in the Seto Inland Sea off the coast of Japan. It is part of the Setonaikai National Park, which comprises areas of the Inland Sea and of then bordering prefectures. Hiroshima is the nearest major city, and the island can be reached by chartered boat or ferry. From Hiroshima Station, take the JR Sanyo Line to Miyamaguchi Station, which takes around 20 minutes one way and is included in your JR Pass. Alternatively, from central Hiroshima, you ca take a tram to the Miyajimaguchi ferry port. The ferry pier is only a short walk from the station. 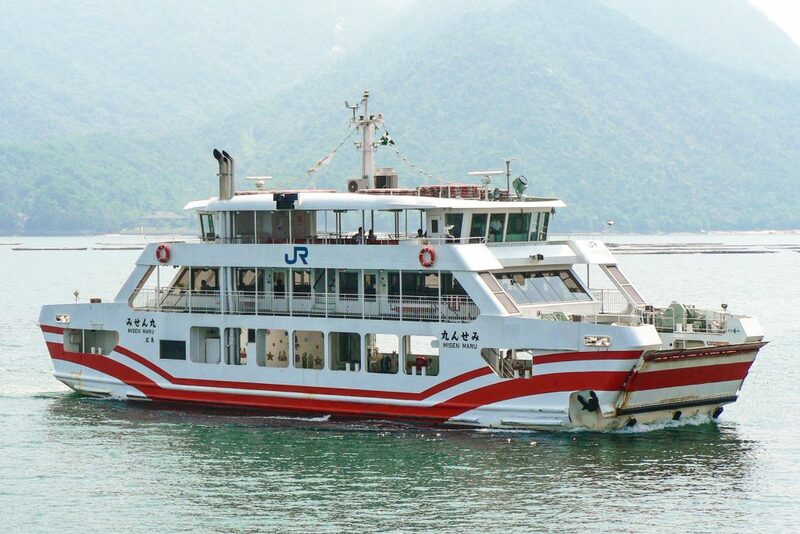 The good news is that you can use your Japan Rail Pass to access the JR ferry for free. The ferry ride takes only about ten minutes. Ferries depart from Miyajimaguchi from 6:25am to 22:42 and return from Miyajima from 5:45am to 22:14. Most ferries depart every 15 minutes. Boats are also available, departing from the Hiroshima Peace Park. These boat rides are not covered by the Japan Rail Pass and take approximately 30 minutes, with 6-8 round trips per day. 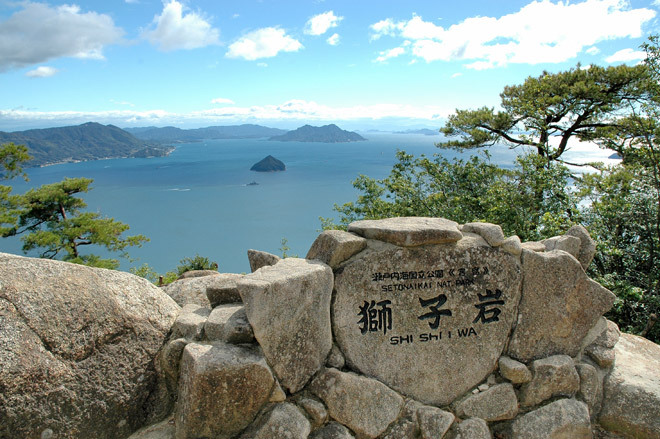 Most of Miyajima’s attractions are concentrated in the small town around Itsukushima Shrine, extending to Mount Misen. Those who enjoy traveling on foot will find this close proximity ideal. This ancient Shinto shrine, constructed around 1168 C.E., is the center of activity on the island of Miyajima. This shrine is unique in that it is built over water. 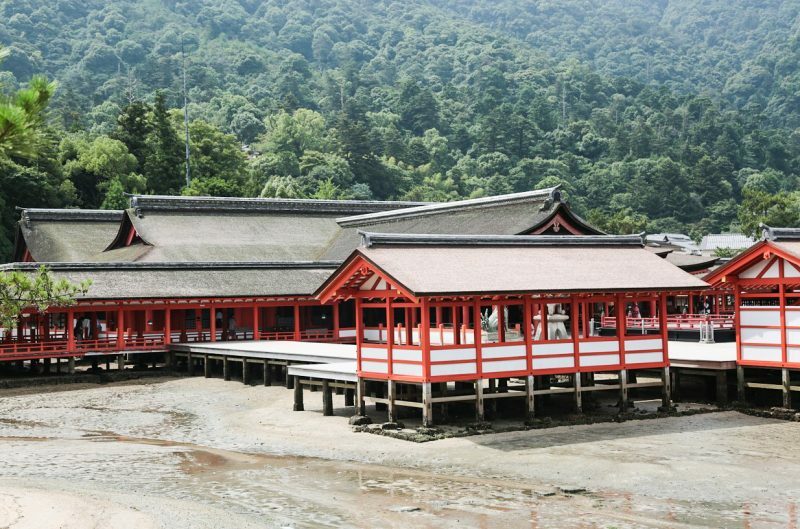 Each of the buildings – the main hall, the prayer hall, and the noh theater – are supported by stilts and connected by boardwalks over the water. The shrine is a mere ten minute walk from the ferry terminal. Paths also lead from the shrine all around the inlet, and visitors enjoy viewing the sea from these paths. The word torii means “bird abode.” These gates are built at the entrance to a Shinto shrine to demarcate the transition from the ordinary to the sacred. The floating torii gate was built as the entrance to Itsukushima Shrine, the family shrine of Taira no Kiyomori. At high tide, both the gate and the shrine appear to float on the water. This is the time that affords the best views and photo opportunities. When the tides recede, visitors can walk to the gate on the exposed sea bed to view it up close. The gate, as well as the shrine, is illuminated for a few hours after sunset each day. Boat cruises are available for night time viewing. At high tide, some cruises even take visitors through the torii gate. 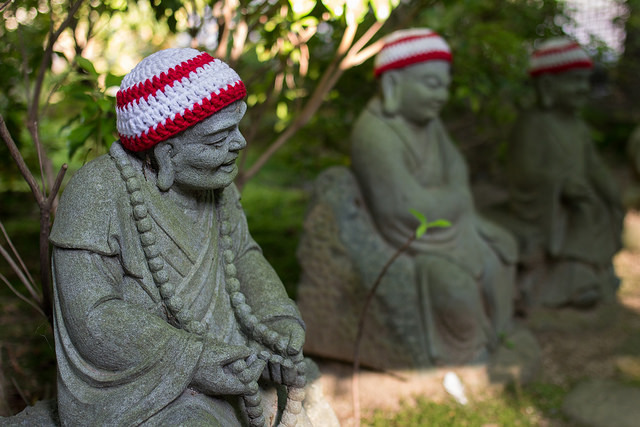 This historic site is one of the most sacred to Shingon Buddhism. The grounds house many buildings and halls, sacred statues, a tea room, a cave of religious icons, and a sand mandala constructed by visiting Tibetan monks. The Daisho-in Temple is about a fifteen minute walk up-hill from the ferry pier. Many visitors to the temple take part in a Buddhist ritual. The temple’s steps are lined with a row of metal wheels inscribed with sutra, or Buddhist scripture. Each wheel spins on a metal axis, and spinning the wheels is thought to bring the visitor the same blessings as reading the verses. This mountain is accessible only on foot or by cable car. Three hiking trails are accessible from the town and converge at the mountain’s summit at 500 meters above sea level. These are known as the Momijidani Course, the Omoto Course, and the Daisho-in Course. The Momijidani Course departs from Momijidani Park. This trail is both the shortest and steepest. The Daisho-in Course is known for having the best scenic views, and it is less steep than the other trails. Each of the trails takes approximately 1.5 to 2 hours to complete, one-way. 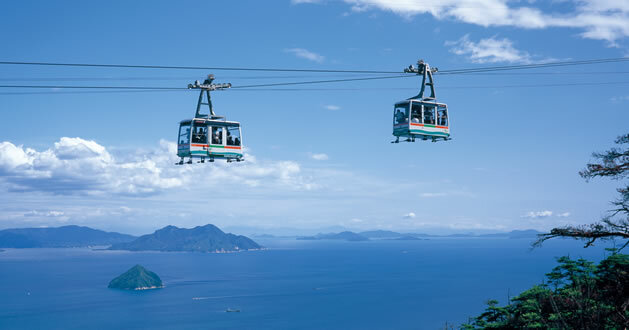 For those desiring a ride up the mountain, the Miyajima Ropeway provides cable car access to and from three stations – Momijidani Station, Kayadani Station, and Shishi-iwa Station. The cable car ride takes around twenty minutes and the ropeway ends at the Shishi-iwa Observatory. The mountain’s highest point is about a one kilometer, thirty minute walk from the observatory, and is the best way to see the surrounding inland sea and islands. Ropeway tickets cost between ¥1000 and ¥1800. Monkeys and deer live on the mountain and have little fear of man, and a quiet walker can observe these animals at close proximity. Mount Misen is especially popular during the autumn season, when its forest of maple trees is set ablaze by the vivid reds and golden hues of changing leaves. There are several historic Buddhist temple structures located near the mountain’s summit, including the Misen Hondo and the Reikado, or Hall of the Spiritual Flame. The flame housed there is said to have been lit by Kobo Daishi, founder of Shingon Buddhism, who lived from 774 to 835 C.E., and has been burning ever since. This flame was used to light the Hiroshima Peace Park’s Flame of Peace. Visitors can also enjoy Momijidani Park, a green area at the foot of Mount Misen, near the valley. This park was designed during the Edo period, in which maple saplings trees were planted. This trees show their blossoms in spring, fresh air and green leaves in the summer, and beautiful autumnal colors in the fall. Hostels and guest houses are available in the town for overnight visitors. An extended stay will allow you to enjoy not only the attractions, but relaxing in the natural hot springs, called onsen, as well. If you’re planning a trip to Japan, be sure to check out our other travel guides and itineraries. Visit the destinations category our article archives. 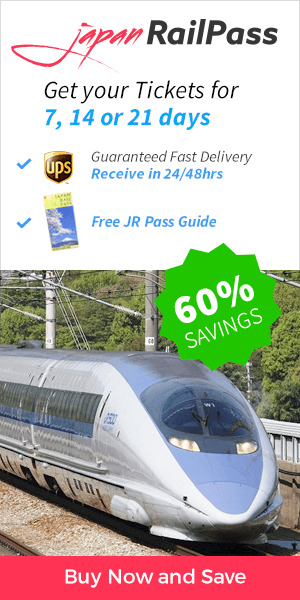 Yes – this itinerary is fully included in your Japan Rail Pass. – Kyoto to Hiroshima: you can take the Hikari bullet train from Kyoto Station to the Shin-Osaka Station, then transfer to the Sanyo Shinkansen line for the remainder of the trip. This trip takes about 3 hours. – To get to Miyajima from Hiroshima, you can take the JR Sanyo Line from Hiroshima Station to Miyamaguchi Station, which takes around 20 minutes one way. The ferry pier is only a short walk from the station. The good news is thatou can use your Japan Rail Pass to access the JR ferry for free. The ferry ride takes only about ten minutes. Hello! We are travelling around Japan in January and planning to do a day trip to Hiroshima. We will be coming from Osaka, could you please tell us the best places to go to and how to get there? We just want to see the historical sight of Hiroshima and the memorial places they offer? Thank you! To get to Hiroshima from Osaka city center, take the JR Haruka Express to Shin-Osaka Station, then transfer to the Sanyo Shinkansen line (westbound, Hikari trains). This trip takes approximately 2 hours and 40 minutes. – Peace Memorial Park, home to the Peace Memorial Museum, which details Hiroshima’s history, the advent of atomic weapons, and the human suffering that followed. – Hiroshima Castle which houses a museum and visitors can enjoy scenic views of the city from its top floor. – Shukkeien Garden with scenic views from the comfort of several tea houses, located around the pond.